This contract covers continued operation of the Chandra X-ray Center (CXC) in Cambridge, which conducts key aspects of Chandra's observation, operations and research program. Core functions of the CXC include system engineering, ground system development and maintenance, mission operations, science and operations planning, science research and dissemination, and outreach support. 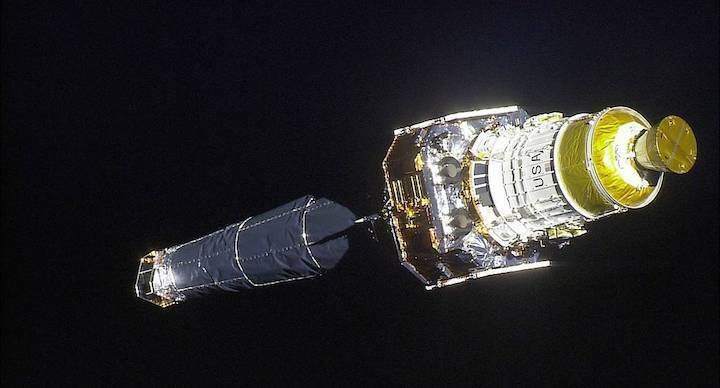 Since its launch on July 23, 1999, Chandra has been NASA's flagship mission for X-ray astronomy and is among NASA's fleet of Great Observatories. The agency’s Marshall Space Flight Center in Huntsville, Alabama, manages the Chandra program for the agency's Science Mission Directorate in Washington. 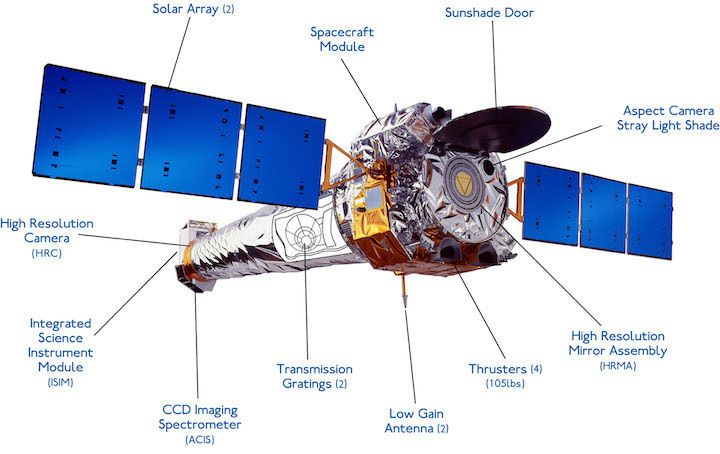 The Chandra telescope system consists of four pairs of mirrors and their support structure. X-ray telescopes must be very different from optical telescopes. Because of their high-energy, X-ray photons penetrate into a mirror much as bullets slam into a wall. Just as bullets ricochet when they hit a wall at a grazing angle, so too will X-rays ricochet off mirrors. The mirrors have to be exquisitely shaped and aligned nearly parallel to incoming X-rays. Thus they look more like glass barrels than the familiar dish shape of optical telescopes. Two additional science instruments provide detailed information about the X-ray energy, the LETG and HETG spectrometers. These are grating arrays which can be flipped into the path of the X-rays just behind the mirrors, where they redirect ( diffract ) the X-rays according to their energy. The X-ray position is measured by HRC or ACIS , so that the exact energy can be determined. The science instruments have complementary capabilities to record and analyze X-ray images of celestial objects and probe their physical conditions with unprecedented accuracy. The spacecraft system provides the support structure and environment necessary for the telescope and the science instruments to work as an observatory. In order to provide motion to the observatory, Chandra has two different sets of thrusters: one for propulsion and the other for momentum unloading. The propulsion thrusters were used immediately after launch to help propel Chandra into its final orbit, which is elliptical and very high in altitude. The momentum unloading thrusters are periodically used to apply torques to Chandra and, thereby, lower the accumulated momentum in its reaction wheels, which are used to control Chandra's attitude. 1999, the space shuttle Columbia, mission STS-93, launched from NASA’s Kennedy Space Center on a four-day mission to deliver the Chandra X-ray Observatory to low-Earth orbit. Chandra was then propelled to an orbit of 44,759 miles in altitude using a two-stage Inertial Upper Stage. This was the first mission in shuttle history to be commanded by a woman, astronaut Eileen Collins. Here, Chandra and its upper stage separate from Columbia with the STS-93 HDTV Camcorder stowed inside the crew cabin. NASA's Marshall Space Flight Center manages the Chandra program for NASA's Science Mission Directorate. The NASA History Program is responsible for generating, disseminating, and preserving NASA’s remarkable history and providing a comprehensive understanding of the institutional, cultural, social, political, economic, technological and scientific aspects of NASA’s activities in aeronautics and space.